Welcome to Tuscany! 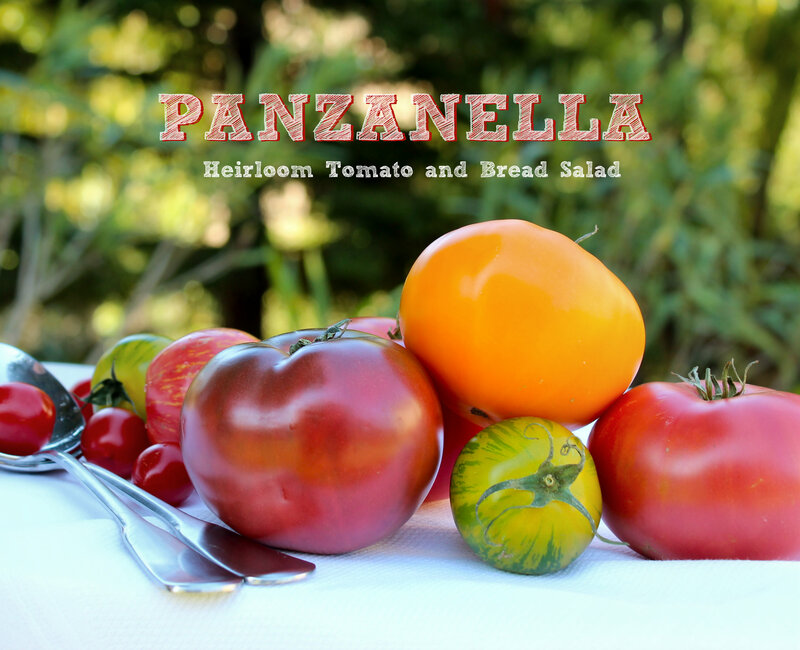 Panzanella is a traditional Tuscan salad usually consisting mainly of stale bread and tomatoes. We know it may seem strange to use stale bread, but this dish ingeniously takes advantage of rock-hard-day-old-bread, turning it into a tasty treat. It’s also a great way to enjoy fresh vegetables – especially heirloom tomatoes which are abundant during the late summer months. For the bread, panzanella is made with a country-style loaf, like that found in Tuscany. Any rustic Italian loaf of bread from pugliese to ciabatta or even a French sweet baguette or batard (heresy!) will do as long as it’s at least one day old. While the Tuscans claim it, you will find many variations of panzanella throughout central Italy with varying ingredients according to the region. Every cook has her version of it. We prefer to toast the bread before letting it soak in the vinaigrette, giving the bread a little more flavor and texture. If the last weeks of summer are still too hot to fire up the oven, consider leaving the bread out to dry in the sun for a couple of hours. It’s a lovely entrée salad that requires no cooking! 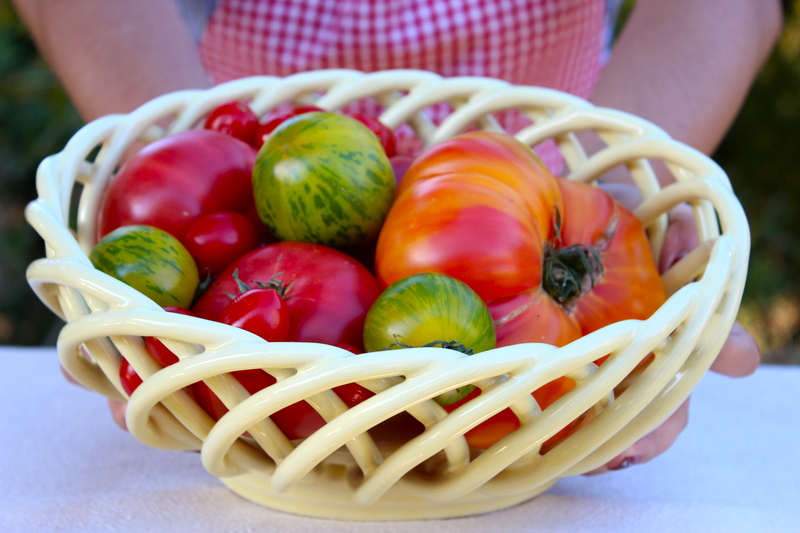 When choosing tomatoes, heirloom or otherwise, pick tomatoes that have vibrant color and are a bit soft. Large, firm, heavy tomatoes tend to have lots of water in them and therefore lack intense tomato flavors. Dry farmed or older, softer tomatoes tend to have less water and more flavor. 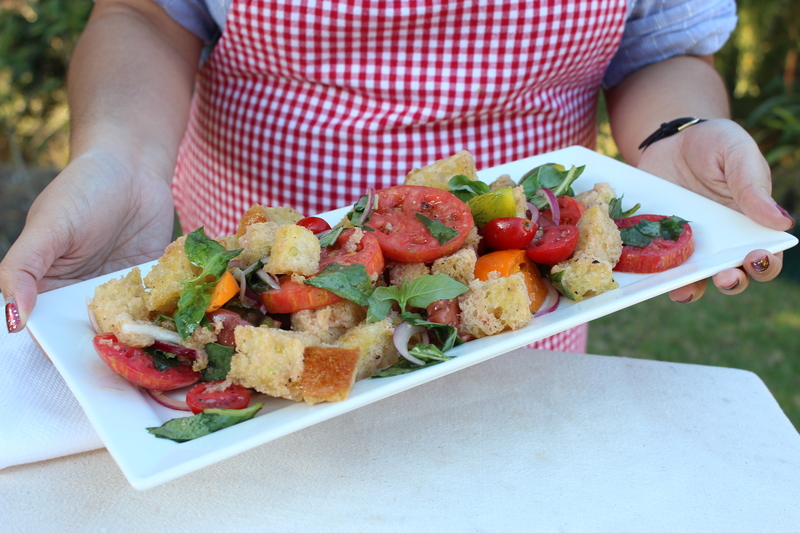 With the best of summer ingredients, hearty bread, and homemade vinaigrette, panzanella is a delicious way to celebrate late-summer flavors! 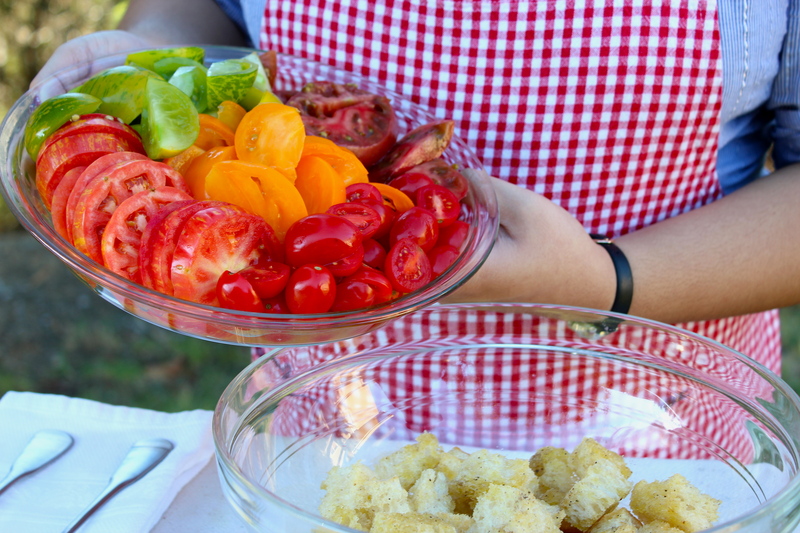 Watch our short little video on how we made panzanella right on our front lawn… and while you’re at it, hit the hotlinks we’ve given you in the recipe below to watch our other cooking technique videos! Break out your best extra virgin olive oil to really make all of the simple flavors in this dish shine! Preheat the oven to 350°F. Make the croutons by arranging the bread cubes in a single layer on a sheet pan and lightly toast the bread in the preheated oven for 10 minutes. Remove from the oven, sprinkle with a pinch of kosher salt and half a pinch of ground black pepper. Set aside to cool. In a jar with a tight-fitting lid, combine the garlic, shallot, vinegar, olive oil and a pinch each of salt and pepper. Screw the lid on tightly and shake vigorously to combine. Set aside. In a large mixing bowl, toss the dressing together with the bread, tomatoes, basil and red onions. Refrigerate the salad for 20 minutes for the flavors to develop. Serve cold or at room temperature.